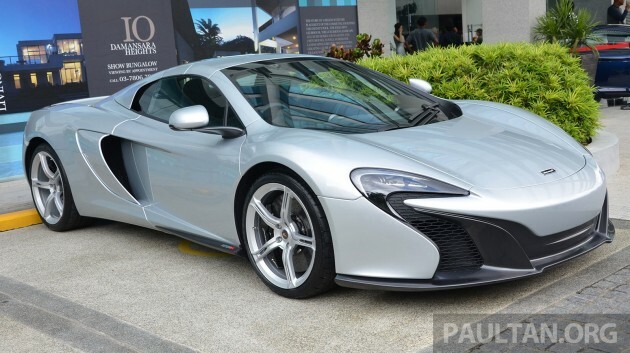 McLaren Kuala Lumpur pulled the wraps off the McLaren 650S at its Mutiara Damansara showroom this morning. The 650S, which replaces the 12C in the McLaren road car range, was announced in February and made its motor show debut at Geneva in March. It is available in Coupe and Spider bodystyles for RM2.4 million and RM2.6 million, respectively, tax inclusive. The 650 in the name is from the 3.8 litre twin-turbo V8’s max power output – 650 PS at 7,250 rpm and 678 Nm of torque at 6,000 rpm. That represents an increase of 25 PS and 78 Nm over the MP4-12C, on which it is based on. For the 650S, the M838T has been upgraded with new pistons and cylinder heads, new exhaust valves and optimised cooling circuits. Also new are the camshaft timing and the exhaust system. The seven-speed dual-clutch transmission has been retained, but tweaked for faster and smoother shifts. Weighing in at just 1,330 kg (1,370 for the Spider) thanks to a “Mono-Cell” carbon fibre tub chassis, the British-built Ferrari 458 Speciale rival accelerates from 0 to 100 km/h in 3.0 seconds, and will reach 200 km/h in 8.4 seconds (8.6 for the Spider). Top speed is 333 km/h for the fixed top 650S and 329 km/h for the folding hard top Spider. The low weight might lead some to think that the 650S is a stripped out Lotus-style car, but this McLaren is relatively well equipped despite the minimalist look of the cabin. A Meridian sound system, parking sensors, reverse camera, electric/heated seats and dual-zone climate control are standard. McLaren’s ProActive Chassis Control suspension system has been enhanced for the 650S. PCC, which allows one to adjust the ride and handling modes (Normal, Sport, Track) independently from the drivetrain, has been recalibrated. The updates are especially noticeable in Sport mode, McLaren says. Design wise, the most striking change is up front, where the 650S wears a P1-style nose with the 913 PS/900 Nm hypercar‘s LED headlamps. The bonnet houses a new McLaren badge inspired by the one from the iconic F1, while the rear features a 12C-GT3-inspired three-piece bumper. Door blades behind the front wheels, on the leading edge of the scissor doors, improve front-end grip and balance. “An important distinction for us is that many McLaren owners do use their cars every day, and frequently drive hard on track days. The 650S is designed for both, as the comfort levels rival the very best executive saloons. It really is a no compromise option for the most discerning individuals who really appreciate the best things in life,” said Simon Rock, director of Sime Darby Auto Britania. This car will sell well in Malaysia. All the big towkays will buy it for the Ministers and their sons for FREE. Remember Nazri’s son using the Porsche Cayenne that was bought by some towkay? And the case closed so fast and burried under the carpet? Well, there are lots of Nazri and sons around. Expect to see this McLaren to sell VERY well in Malaysia. For a few to live rich, Malaysians have to die poor. For the cronies to have new toy, Malaysians have to keep on supporting Proton. From the interior, very obvious it is “English”. Such dull compare to Italian. I like the minimalist interior compared to fussy 458’s, however, 458 exterior looks way cooler than 650S. I wonder how many owner’s review we will see in Car Base.com.my …hahaha. Just admire only :), cannot touch also! The two V-shape diffusers under the front bumper of this >2 million car is definitely a copycat of Honda NSX! We have this McLaren launch and at the same time there’s news of the first right hand drive version of the Tesla Model S. As nice as the 650s is I’m still far more attracted to the Tesla which IMO is truly revolutionary. If only the original Tesla roadster was as good as the Tesla model S.
Please la…. don’t buy it! Our G tax us like hell! Gosh…u can tick what ever interior material u want it made from, just that ‘plastic’ panel was the basic without any added cost….wait, have u ever buy car before? I hope LHDN is alert and awake when someone pays the downpayment for these super rich toys. Don’t just go after the char kweh teow hawker who is paying some taxes while the big todak swims away unchallenged. as usual impression mclaren model. front curve(headlight) make it different and looks so awesome. For a car that costs so much, it sure has a very spartan interior. Sigh…! i am just curious, how many units can they sell it here ? nice car indeed. At 2.4mil, not everyone can buy. But this is not meant for average joe. Please guys, stop shooting a particular party. Even i hate BN to the core, sometimes we have to be rational before we judge things. otherwise, what makes us different from from those UMNO Youth anjing liar? that’s why anti-UMNOs start to behave more like anjing liar..and most of the time WORSE than them. Bring in McLaren P1 !!!!! The interior doesn’t look like a RM2.4mil car.